Red mulberry is a tree that grows to a height of 60-70 feet; the alternate, serrate (heart-shaped) leaves are cordate, rough (sandpapery) on top and soft or hairy beneath, and palmately lobed to simple. Flowers are in tight, drooping clusters. The purplish-red fruit, not a true berry, is made up of many small drupes. 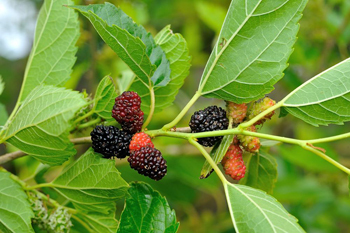 Another variety: Black mulberry (M. nigra) is a European and Asian tree which is also cultivated in the United States, particularly in the South and in California. It grows to 30 feet tall and bears purple to black fruit. Medicinally, its bark is equivalent to that of red mulberry. A native Chinese tree, it is a common ornamental tree in this country. Also, called M. microphylla which grows in Texas. Found in rich woods in Vermont, New York to Florida; Texas, Oklahoma to South Dakota. Found from Massachusetts to Florida and west to Kansas and Nebraska. About 2700 BC the Chinese began cultivating the white mulberry tree as food for silkworms to produce silk. The secret of the art of silk production was kept in China for about 2,000 years, but around 700 BC the practice spread to other countries, including the Babylonians, the Greeks, and the Romans. According to Chinese legend, the silk industry was started by the beautiful Chinese empress Si Ling-Shi, who, watching a silkworm spin his gossamer cocoon on a mulberry tree in her garden, desired a gown made from the threads off many such cocoons. She accidentally dropped the cocoon in her tea and it softened, allowing the empress to unwind its threads. Si Ling-Shi got her husband to give her a whole grove of mulberry trees, so that she could get enough threads to weave her gown. Though it took her several years of working long hours with the worms and the cocoons, she finally unwound enough thread to weave the material for the dress. The Chinese named the material Si for their empress, and silk is still known by that name today in China. Because the prosperous silk industry was so important to the early Chinese people, the mulberry was revered in ancient China as a sacred tree. Some scholars connect it with the fa-sang tree, a symbolic tree of life that appears in the mythology and art of the Han Dynasty (202 BC – 220 AD). In classical legend the red berries of the mulberry tree acquired their color only after two young Babylonian lovers, Pyramus and Thisbe, bled and died under a white-berried mulberry tree. The Pyramus and Thisbe legend is the source of the story of Romeo and Juliet. White mulberry leaves treat colds, flu and fevers. The bark and fruit may be eaten as food. The small branches are used for rheumatic and arthritic pains, especially through the extremities of the body. Small twig tea is said to improve vision and circulation, reduces high blood pressure, headaches, and help diabetes by stimulating insulin production. The fruit is given as a blood tonic, anemia, consumptive diseases with thirst, premature graying of the hair, canker sores, burns, piles, dizziness and insomnia. Very good for constipation in the aged caused by dryness from deficient blood. The bark of the root is anti-inflammatory to the lungs and bronchioles, helps reduce edema, quiets cough, wheezing in asthma and emphysema, fever, and difficulty in urination. Leaves were poulticed for toothache, snakebites, and as an antidote for aconite poisoning. The bark is a traditional European remedy for tapeworms; it is used as a decoction. Also, used as a laxative preparation for home use. Native Americans used the milk juice to cure ringworm on the scalp; drank root tea for weakness, difficulty in urination, dysentery and lowering fever. Vitamins A, B, and C, and carotene in the fruits. It should be avoided by individuals with a tendency towards diarrhea (SEE DIARRHEA and weak digestion. Avoid the use of the leaves and bark if the lungs are weak. Avoid excessive use of the fruits if suffering from diarrhea. The milky juice and the unripe fruit cause hallucinations, nervous stimulation, and stomach upset. Avoid the use of the leaves and bark if the lungs are weak Large doses cause vomiting.